History SoTL: The Society for the Scholarship of Teaching and Learning in History: http://www.indiana.edu/~histsotl/blog/. There’s work going on to redevelop the site but already a major source of information about practice and research into history teaching and learning in higher education in the US and internationally. Center for History and New Media, George Mason University– http://chnm.gmu.edu/. Pioneering center for the use of new technologies in teaching history and historical thinking. UK History Subject Centre http://www2.warwick.ac.uk/fac/cross_fac/heahistory. The site of the UK centre for teaching history in higher education. Closed in October 2011 but the site contains some excellent resources. History in the Higher Education Academy http://www.heacademy.ac.uk/disciplines/history. UK provision replacing the History Subject Centre. A small but growing number of resources supporting history teaching in higher education. Making Digital History – http://makingdigitalhistory.co.uk/ – website hosting large range of resources on using technology in teaching history. 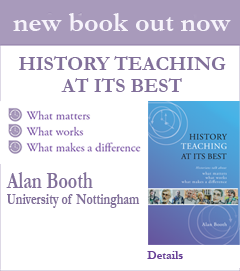 Hosted by the School of History and Heritage at the University of Lincoln UK. We will try hard to keep these updated but please let us know via the comment form below if any of the links are broken or you have suggestions for others.